Washington’s First Annual Harvest Festival was a Great Success! A great day was had by all at the First Annual Harvest Festival at the Riverwalk Pavilion. 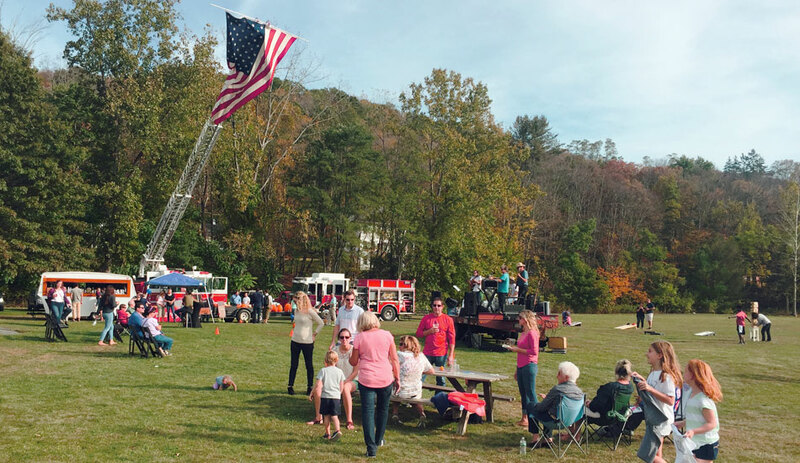 Under sunny skies and with nonstop live music by The Regulators, over 700 happy participants enjoyed harvest activities and an unbeatable community spirit. Many thanks to Washington Parks and Recreation and the Washington Business Association for all the planning and hard work that went into this unforgettable day of community celebration! The littlest Washingtonians had a blast with fire truck rides, hay maze, pumpkin carving and face painting. Our very own First Selectman, Mark Lyon, flipped burgers all day to the delight of the hungry crowd. The scarecrow contest drew much admiration, as local businesses and organizations pulled out all the stops and showed their creativity and dedication. The hands-down winner was this injured scarecrow valiantly rescued by our life-saving, awesome volunteers from the Washington Ambulance Association. And the Dessert Contest results are in: Joan Lodsin took 1st place with a Pumpkin Cheesecake. 2nd place was Liddy Adams with a Papple Cake. 3rd place was Vanessa Hammond for Apple Crisp Tarts. Kids contest winners were Ona Swanson and Emma & Brennan Sisk. We thank our local businesses and nonprofit organizations who participated in this great event. And to the many visitors – thank you for joining us and we’ll see you next year! Visit our Facebook page to see more scarecrow photos!